A few months ago I picked up what is easily one of the greatest and most reasonably priced garage gym accessories available; the Spud Inc Economy Lat & Tricep Pulley. I believe that this cable system is hands down the best $85 (it is now at $99) that I’ve spent on a piece of equipment in a long time and I felt that it deserved to be praised for a few minutes. Let me start out by saying that I’ve pretty much always wanted a pin-select pulley machine in my garage gym; a station for doing tricep pushdowns, weighted crunches, and face-pulls. Actually truth be told what I really wanted was a full cable crossover, but there’s just no way I could fit that in my garage, so a single-stack unit would have to do. Anyway, about a year ago I priced a number of these units out, but the asking prices for the equipment along with the freight was just a bit more (a lot more) than I was willing to spend for what basically amounts to an accessory. Couple the high price with the amount of floor space required for a commercial station like that and I just let go of that dream. Multi-station version of the cable pulley machine. Lot’s of floor space required even for a single stack unit. 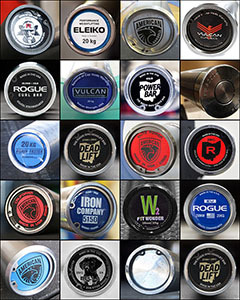 Well not all that long ago; maybe four or five months ago; I saw the Spud Inc. Lat & Tricep Pulley added to Rogue’s “new releases” category, so I took a gander. Spud’s pulley system appeared to be a fairly basic yet reliable way to replicate all of the exercises that I wanted the full selectorized station for (tricep pushdowns, overhead extensions, full ROM weighted crunches, lat pulldowns, face-pulls, etc), but for what seemed super cheap by comparison. I didn’t buy it straight away, but I eventually figured that since the whole system is only $85 I really couldn’t go wrong by giving it a shot. Also I’d be ordering from Rogue, so I knew that I could return it if I hated it. Turns out that I don’t hate it. Actually it’s fantastic. It takes seconds to attach to the rack and seconds to take back down. It holds more weight than would even be reasonable for pulls (500+ pounds), and it uses standard caribiners so any attachment you can think of works; an EZ bar, tricep bar, wide lat bar, parallel bar, tricep rope, whatever. So yeah, no regrets. Just a sample of some of the attachments that you could use with the Spud Inc. Lat & Tri Pulley. These happen to be Ivanko in case you’re wondering. Now it’s no secret that a lot of these cable movements can be replicated to a certain degree with resistance bands. Matter of fact, prior to picking up this pulley system, I was doing just that. Bands are fine and all, and they can be used effectively for many movements, but they are not always ideal. The nature of how bands work means that there is always going to be a varying amount of resistance; they start out “light” and become “heavy” as stretched. That can be used to your benefit to mix things up, but not if it’s the only way that you can ever perform a given movement. The consistent resistance that you get from a weighted cable is just hands-down a better feeling in my opinion. Another thing about using resistance bands for so many different accessory movements is that in order to have a nice variety of thicknesses and lengths so that resistance can be gradually added over time, you need a fairly hefty collection of bands. My own collection of resistance bands has cost more than twice what the pulley cost, yet the pulley is far better in many ways. Any Negatives for the Spud Pulley? That said, there are a couple things that take a little getting used to since this pulley system is not part of a stand-alone station with its own weight stack. 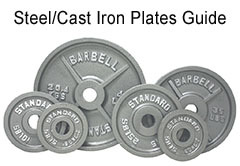 For starters, you’ll be loading your own weight plates, and typical plates are 450 mm in diameter; quite wide. You will need to position yourself a little further away from whatever you attach this to in order to keep your body clear of the weight plates moving up and down. This isn’t even a negative or a problem btw, I’m just making you aware in case you want this for some special movement I’ve not thought of; something that puts you awfully close to the weights. End of the day I have no apprehension about recommending this product. If you’re currently using resistance bands, or just ignoring these types of accessory movements altogether, you might consider checking this out. It’s really a small price to pay for access to so many useful accessory movements. It doesn’t help with the delt flyes or cable crossovers unless you can manage to install two of them, but you still get a lot for the price. Super affordable; only $85 ($99 direct from Spud… go figure.) Assuming you have a rack to attach it to and some weights to load on, you’re good to go about 60-seconds after UPS drops it off. Yes, it literally installs in a few seconds. You just throw the cable over, run the other end through the hoop, and pull down. Boom, secure. Pulley system installed and ready to use. Compatible with all cable attachments. Use the ones you have, the one it comes with, or buy more. The included nylon handle is a nice and somewhat unique attachment. 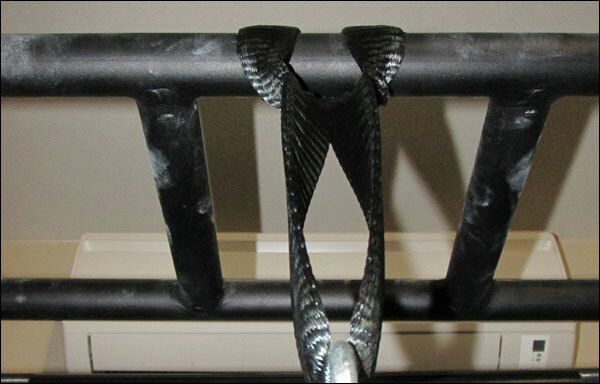 Its like a cross between the tricep rope and a parallel grip. It’s a little stiff new and needs to be broken in, but it’s solid. Far superior to resistance band variations, at least in my opinion. Stronger than it needs to be. You may be able to pull 300 pounds, but you better weigh more than that or you’ll find the only thing that comes off the ground is you. Takes up no space in your gym when not in use; it’s just a cable and nylon. Heck you can store it in a small bag or box. It works. I’ve had killer tricep and rear delt progress since getting this. I don’t lat pulldown because I can do weighted pulls and chins, but I’ve had great success with the movements that I do use it for. So there you go. Let me add that I don’t work for Spud, I’ve never even spoken to Spud, and I paid for this out of my own pocket. 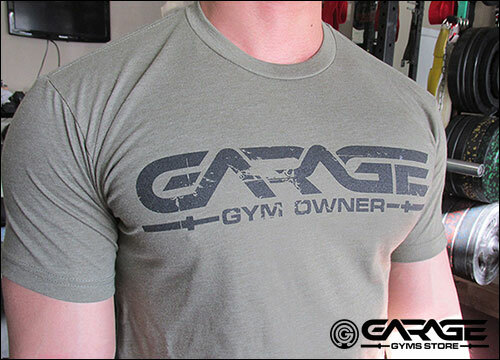 I simply think that this is one of the best garage gym products under $100 on the market, and I will definitely try and review another Spud product after having used this one. Happy lifting! Looks awesome. Wish I had a proper rack! In the meantime, sounds like Spud is pretty well regarded. Might spring for those farmer’s walk straps once the weather gets better. Yeah I’ve heard good things all around. I’ve been eyeing the farmers handles too, maybe try one of their better belts. 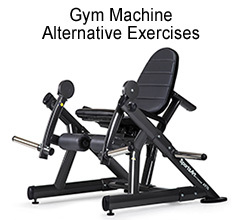 I have this plus a second pulley for low row/bicep work and I’d like to add a few minor observations. 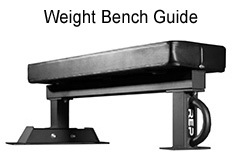 First the weight can swing back and forth depending on the load and exercise you’re performing. You’ll have to consider clearing the rack as part of your setup time. For this reason I’m considering running a second pull-up bar from my rack to the wall, or, an idea I stole from some smart person in a google search, hanging them from spotter arms and creating a crossover system. Second the carabiners used by Spud seem to get a lot of hate in customer reviews for having a low load capacity in comparison to the rest of the system. I’ll never be moving enough weight to find out, but they’re easy to swap for something different if you care. Last thought is I wish the cable was sleeved with something rather than bare. For the wolverine types out there when you catch the cable just right changing weight you’ll get bit and end up minus some hair. I’ve noticed that about the hair haha. Smarts. Yeah I think the system could definitely be made to a higher standard overall (caribiners, sleeved cables, cable length varity, etc) but I don’t think that it really needs to be, and if it was it would cost more than $85. Rather I think it’s better to expand on the system for those who wish to. Also, I didn’t go into this in the article, but I have a wall-mounted band anchor opposite my rack (which I use as the other anchor); a good 12-14 feet apart. With my resistance band selection I am able to do delt flyes and crossovers with bands that feel almost no different than being in a full crossover machine. I know it’s not relevant to the pulley, but it’s that distance between the two anchor points that makes for a great crossover… an angle that couldn’t be created with pulleys hanging from spotter arms 48″ apart. Love the reviews mate. You should post some pics of your current set up! Cheers. Could this be suspended from a ceiling mounted pull up bar? I figure that if it can handle me doing kipping pull ups at 200 lbs, it’s probably safe to use for this but I’d like your thoughts. You know, I don’t know. I’ve got a ring hanger that attaches much like a pull-up bar, and I thought about trying it, but something didn’t feel right so I never did. Probably? But I’m not 100% so don’t take my word for it. I’ve had the Spud Inc Econo Pulley for a while, and a couple months ago I added a second pulley and cable from the hardware store that I attached to my RML3 with a Rogue shackle. 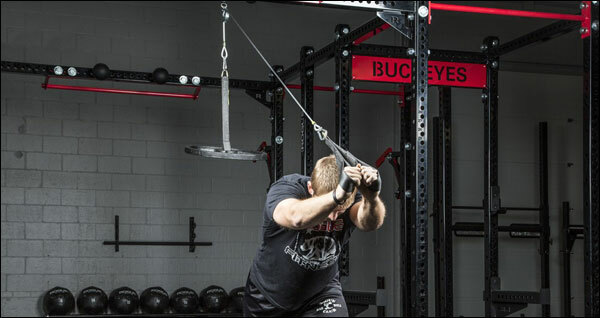 This has given me the ability to do both high and low pulley work, and it has added a lot of diversity to my training. At this point, I’ve just been using the included Spud Inc strap attachment and a 48″ lat pull down attachment. I want to add a few more but not looking to fill my gym with cable attachments. What are your top 3 to 5 most used attachments? 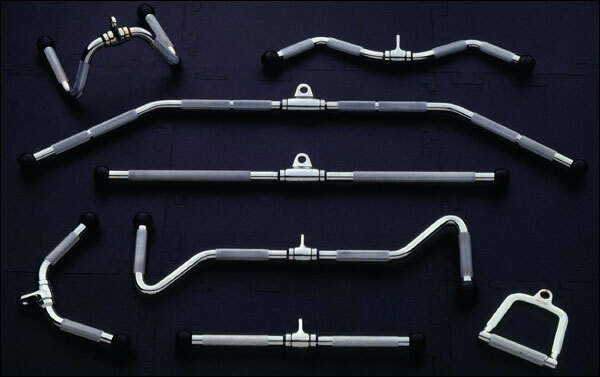 I use the included Spud strap, revolving pressdown V-bar, and a seated row chinning handle mostly. 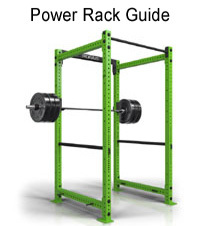 I was trying to figure out how to get a pulley system on my rack and stumbled across this. After looking at how Spud put this thing together, I am 100% certain that i can knock one of these together for about 20 bucks tops. You can. 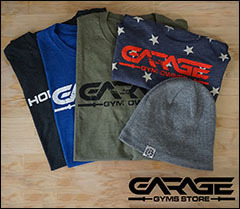 I have another article on the subject that will point you in the right direction for some of the parts (https://www.garage-gyms.com/how-to-repair-upgrade-rebuild-your-spud-inc-pulley/), but it can be done for even less if you’re willing to put in the time and effort researching and getting your hands on everything. I have a pull-ups and dips power tower in my home gym (Bowflles body-tower). Is it possible to attach the Spud inc Pulley system to it? Has anyone attached the spud Pulley system to a power-tower (and not to a cage \ rack)? Will it be safe, or it’s too dangerous and the power tower can fall on to me? Seems like a bad idea to me. Even if you could somehow prevent the tower from sliding and tipping over, where are the weights going to be able to travel freely up and down?